SPRING PLANTING IN A VINTAGE TIN BATH. Gardening jobs for the week end: A couple of months ago I was lucky enough to stumble upon this delightful vintage tin bath for a snip at £13.00 Expect to pay up to £30.00 for one in good nick, as vintage gardening bits n bobs have really seen a price boom! Anyway, it was late in the year, and I'd planted everything, so it sat quietly in a corner till now. I think it will look lovely filled with early spring bulbs! If you haven't got your spring bulbs already, don't panic! The garden centres are full of them. My most favourite spring bulbs are Tulips, and the tulip named 'Angelique' is top of my spring list closely followed by 'Black Parrot'. But thats another post. I wanted to stick to soft whites with a hint of powder blue for my tin bath planter. When choosing your bulbs consider the hight of the flower, fragrance and most importantly.... the time of bloom! Some spring flowers start as early as Feb and some don't start till late May. Ive gone for bulbs that flower from March to May, thus giving me a continuous burst of flowers. When planting in containers, its so important to consider drainage. Make sure your planter or bath has got drainage holes, and I like to put a few broken pots in the bottom too. (please note, when planting grown plants, it is not necessary to do this, as the experts now think that this can cause root damage and restrict the plants growth). 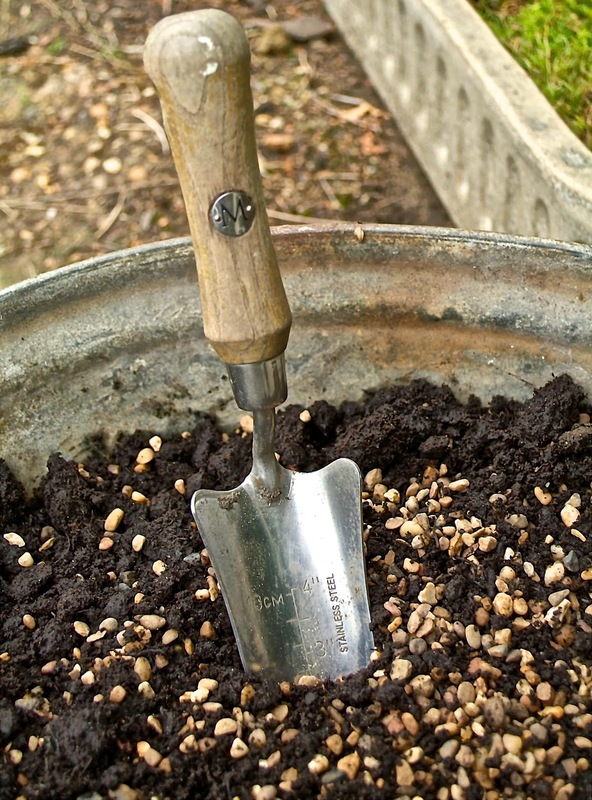 Fill your planter with either bulb compost or if using a standard compost, mix in a good amount of grit. Next tip.... Read the planting instructions! All bulbs vary on the depth of planting they require. A marked dibber or trowel is helpful. Consider the flowering height, as this will determine where you place them. Ive planted the tall tulips and daffs near the back and planted smaller bulbs near the front. To finish add a layer of grit, this will help stop any weeds. Now you've got a long wait... but it will be sooo worth it!